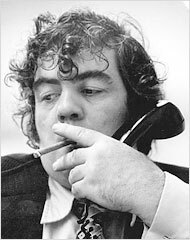 NEW YORK– Sometime later in the evening Jimmy Breslin is sitting on the bottom step that leads to the basement room of Jimmy’s at 33 W. 52nd Street in New York and is taking a nap with his head resting against the railing. A party is in progress, a New Year Party. Suddenly, Breslin snaps his head up and says to somebody he knows who is walking by, “You’re crazy. What do you mean by inviting all these papers here. They’re going to make it out into some kind of dilettante thing like ‘radical chic.’ It shudda been completely private — no press.” The guy shakes his head and walks away. “It wasn’t any of my doing,” he says. Now this is a very interesting thing for Breslin to say. Because this party, a classic New York party, is for the people who were named on the White House list of enemies, which was made public in the press last month, and is ostensibly being given to honor investigative reporting and to hand out the first of a series of annual awards for same. The White House enemies list was a great thing for some people. Because while everybody there is a liberal and strongly anti-Nixon, everybody else there already knows that everybody there is a liberal and no shakos are being distributed for this distinction. The great thing about being one of those named on the list is that it made them a certified enemy; quite literally the government had affixed its stamp of approval to their liberalism, like USDA prime. ONE OVERLY POLITE reporter out of town wants to talk with Breslin on this very point, but he walks away and takes a seat near the stage to get ready to go up and announce the award. It is being presented by a new magazine, the New Times, which is going to appear for the first time this fall and of which Breslin is a contributing editor. He is very ticked off. Because he has been a reporter for many years himself and he can smell it coming: “RADICAL CHIC,” in big capital letters like that, and it’s not supposed to be that way at all. He looks around the room and sees Otto Preminger being swarmed by beautiful girls with very few clothes who are looking up winsomely at that classical bullet-shaped Teutonic head and clearly remembering that he is a big movie producer. Off to one side the television crews are interviewing Herman Badillo or Mayor Lindsay’s brother or somebody or other, their ninth or tenth for the night. GEORGE PLIMPTON is talking with Norman Mailer and trying to get him to come out to his place on Long Island for the weekend to watch the running of the giant tuna. Mailer is standing with this beautiful girl who looks like Ali McGraw and has an astonishing figure and he is nodding no, he doesn’t want to go anywhere this weekend. “But Norman, you really should come out. You should see them, giant silver tuna, you’ve never seen anything quite like it in your life.” The girl with the astonishing figure is beinginning to look around the room. It is a room filled with maybe 500 people, of beautiful women moving smoothly, knowing they look cool and irresistible, of well-tanned successful looking men in well-tailored suits… all sort of, as someone once described it, like a convention of the Botany 500.
manager for George McGovern, is chatting with Bayard Rustin. Columnist Murray Kempton is holding forth to a rapt table. BACK IN 1970, the Leonard Bernsteins’, the composer and his wife, gave a party to raise legal defense funds for members of the Black Panthers, then under indictment in New York for conspiring to blow up certain public buildings. 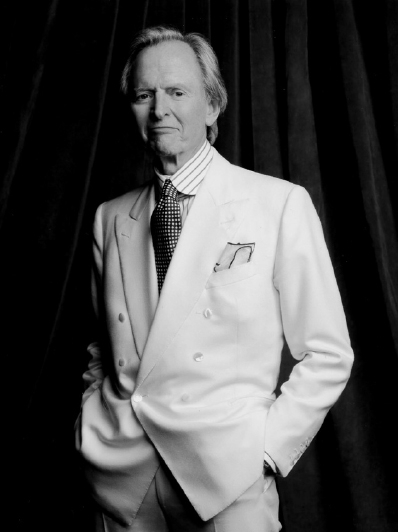 In June of that year, Tom Wolfe published an article about it in New York magazine called “Radical Chic.” If you missed it, that’s too bad because the article was a masterpiece of reporting and is as certain as anything to become a permanent footnote, and maybe a chapter, in the cultural history of America of the 20th century. were saying they would tear down a style of life that was, when one considered it dispassionately, after all, one’s own style. Excruciating. Wolfe likened the occasion ot the turn-of-the century English rage for “nostalgie de la boue” — nostalgia for the mud. To all kinds of social relationships sought with one’s inferiors for the sheer thrill and a certain reverse cachet involved, like the young bucks of Regency England taking on the dress and mannerisms of club boxers and other low types. THERE WERE RICH DETAILS, like descriptions of the chic and beautiful women, the dream fantasies of Leonard Bernstein and his incination to engage in endless games of mental lotto. “But you didn’t answer the kvestion,” Preminger keeps saying to one of the Panthers ina German accent like a screen Prussian heavy. Charlotte Curtis, of the New York Times, came to much the same conclusions about the party, writing the next day for the Times’ social pages. But it was Wolfe’s article that really devastated people in a certain set in New York and will hang in their consciousness for the rest of their lives. What Wolfe had done, aside from writing a magnificent piece of social criticism, was scare the hell out of several hundred people. THERE IS OTTO PREMINGER coming into the basement room and the TV cameras move in on him before he has covered the first square yard of industrial-grade carpet. HERE LIKE THERE the people have come, paid $30 a ticket, to contribute money to the Reporter’s Defense Fund, a group established to pay the legal defense of investigative reporters indicted or sued becuase of their activity in digging out sensitive stories. But Wolfe wasn’t writing about that aspect at all, he was writing social commentary. The fact that the defense fund was successful in its purpose was another matter. “What you Americans don’t understand,” a blonde said as she staggered. “Oops. I’m afraid I’ve had a little too much to drink. “No you can’t use my name. Yes. I am Margaret Berg. Miss Berg. But I mustn’t tell you what you don’t understand because I’m not even a citizen, I’m from Germany. “I am a descendant of Elsa of Brabant. My family is from Kleve. You never heard of that, right?” The reporter had actually been to Kleve but said nothing. It is a town of quiet burghers undistinguished except for a windmill nearby and a rather spectacular set of hill roads leading down into the square and is the first place of any size you reach on the road out of Arnheim. It achieved some note as a rustic watering place when Charlemagne established his capital for the Holy Roman Empire at nearby Nijmegen back in the ninth century. But that’s all another story. ‘WHAT IS IT you Americans are too concered with? I forget. “Oh yes, You are too concerned with someone’s family and the labels in their clothes.” Miss Berg is an executive secretary with Doyle, Dane & Bernbach, the people who bring you the Volkswagen ads and she knows about the right labels in clothes. MR. AND MRS. SHOPSIN know nothing about the right label in clohtes. They own Shopsin’s Grocery Store, a little corner place in Gereenwich Village, and they crashed on freebie tickets, of which there are not supposed to be any at a high purpose party. Ken Shopsin wore Sweet Orr (Can’t Bust-em) overalls, size 44, with side vent pockets across the chest. “I don’t think these are my kind of people,” Mr. Shopsin said as he left.